Did you make a fitness resolution this year? With the warmer weather comes the motivation to get out, get moving and get fit. It is important to remember that with all of our new found eagerness to get fit and find that summer body that slow and steady wins the race. There is nothing more frustrating than getting injured just as you embark on a new fitness regimen. So here are a few tips to get you safely and successfully to your fitness goals…. If getting into exercise seems all too daunting and you don’t know where to start there are many options to start getting the body moving. Clinical Pilates is a great way to add strength training into your program without lifting heavy weights and going to a gym. It is a misconception Pilates is ‘gentle exercise’ and only about the core. 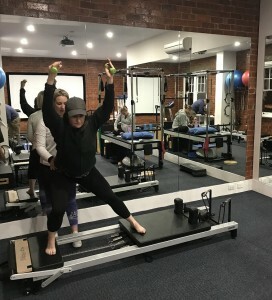 Clinical Pilates targets strengthening of the whole body, and at SportsFit we utilise a variety of body weight (matwork) or spring resistance (reformer, trapeze). You will have an individualised program to work on your specific goals and needs. The classes are up to 4 people, so they are small and supportive. 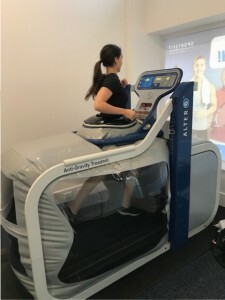 The Alter-G is an anti-gravity treadmill that allows you to walk/run/exercise at a percentage of your body weight. This is great for those who want to reduce the load on their joints as they improve their fitness and strength. It is also a handy tool for those returning from injury, recovering from surgery or even athletes wanting to improve their pace or endurance. Our cardio classes involves high intensity interval training designed to get your heart rate up and muscles burning. These are perfect for people wanting to improve cardio-vascular fitness, lose weight and generally work-up a sweat when exercising. Classes are kept to a maximum of 5 people ensuring close supervision and to allow your workout to be individualised. At Sportsfit Physio and Health we can help you achieve your fitness goals and get you summer and life fit. 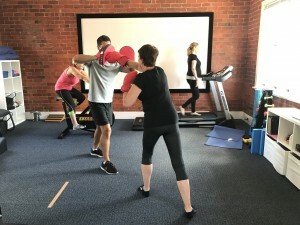 We offer private and group Clinical Pilates classes, group cardio classes and have the Alter-G available to help you get moving.